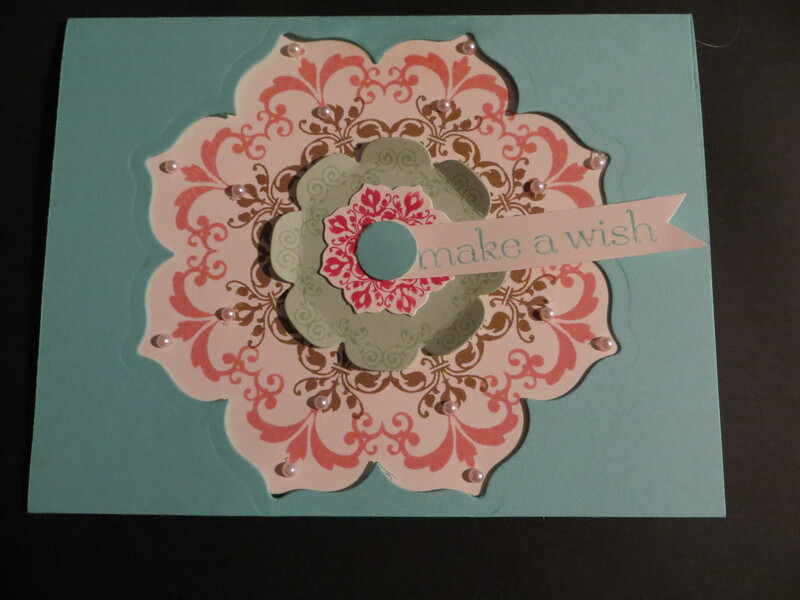 Today’s card a is very pretty card showcasing the Daydream Medallions #126467 and the coordinating Floral Frames Framelits Collection #127012. I used the large framelit to cut a hole and then added stamped layers and some cardstock layers. I adorned the card with basic pearls #119247. 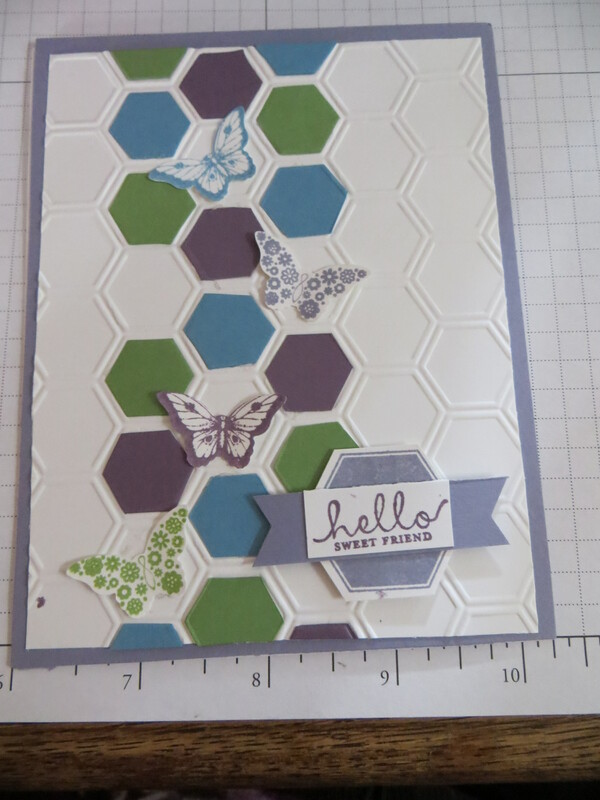 I went wild with the Six – Sided Sampler stampset #130956. I used 1 stamp set and made three separate looks. Happy wedding day to my niece, Melinda and her husband Karl. To honor the bride and I groom, I made this card. 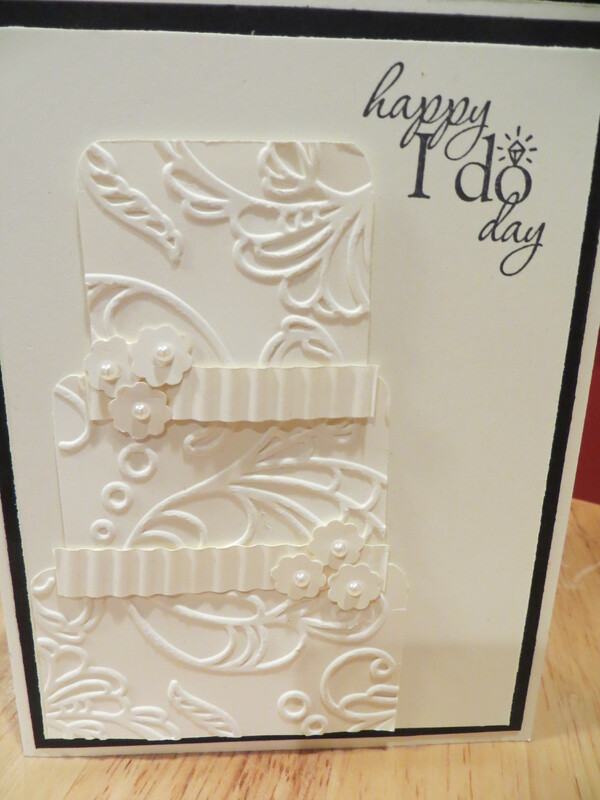 I cut three rectangles and textured them with the Elegant Lines (no longer available) embossing folder. I crimped a piece of cardstock to separate the cake layers and added a few flowers complete with basic pearls. The sentiment is from a now retired stamp set. Cheers to Mr an Mrs Karl Kaiser! Today’s card is a simply beautiful card featuring the Regarding Dahlia #130327 stampset from the current Stampin Up annual catalog. 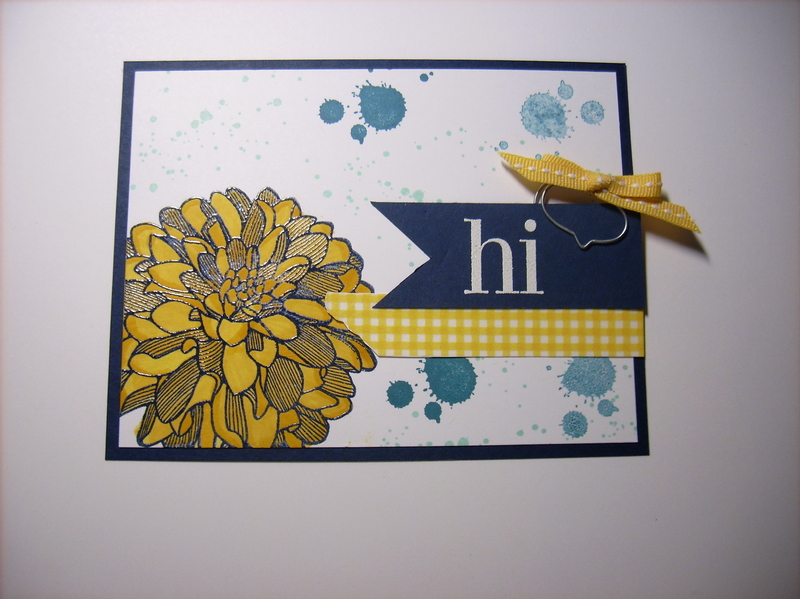 She embossed the dahlia in black ink and colored it with the daffodil marker. She added some grunge using the gorgeous grunge #130517 stampset. 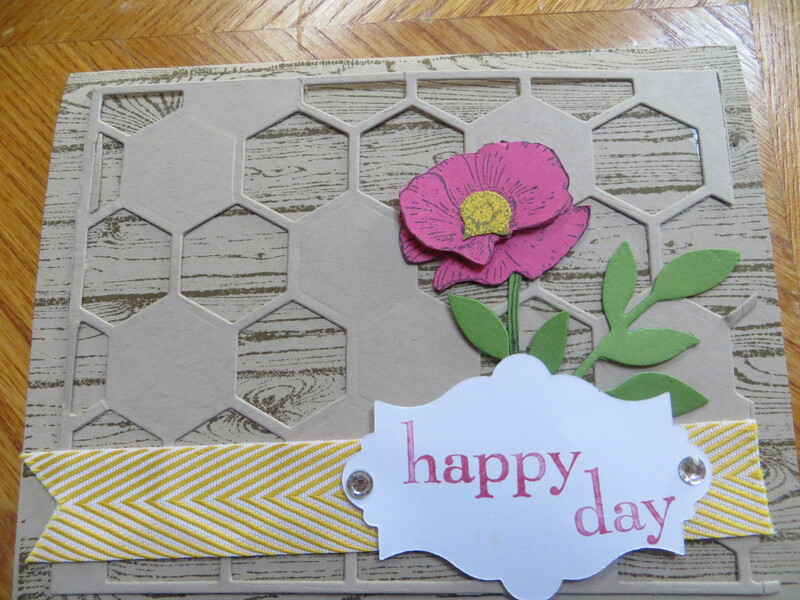 She added a banner cut from the Banners Framelits #132173 and an embossed sentiment from the Regarding Dahlia stampset. She added a clip and a bow from the daffodil stitched ribbon and a piece of washi tape. Today’s post is a CASE (Copy and Steal Everything) that a customer Yvonne Crooks from Broken Arrow OK did when she saw my post from a month or so ago. 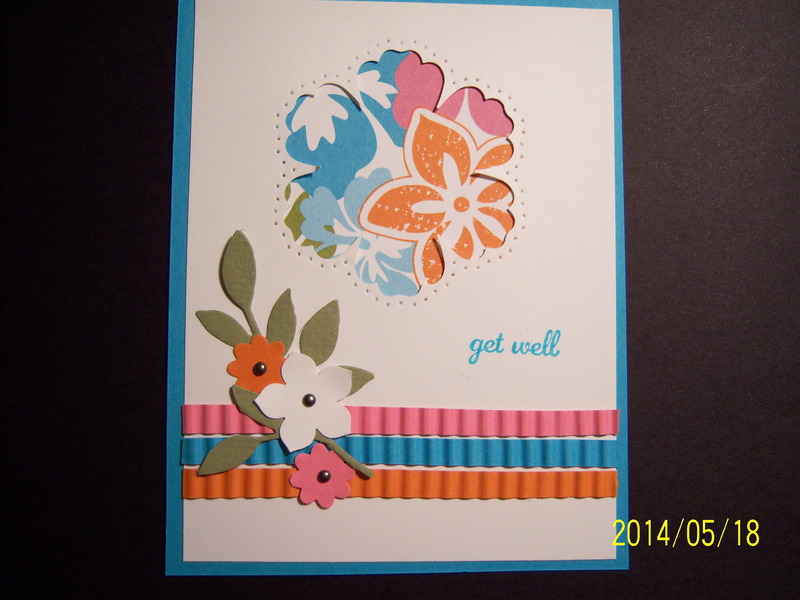 I was flattered that she used my card as inspiration to make 2 cards. It’s days like this that make all my blog work pay off. I love it that someone took the time to use my card as inspiration. Thanks Yvonne. Today’s card is one that I have used for happy occasions and also for not so happy times just but swapping out the sentiment. 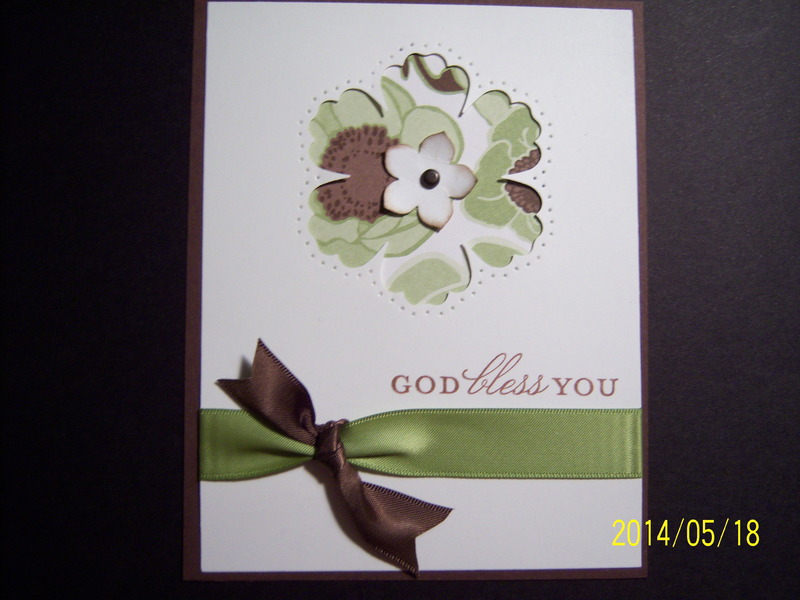 The card base is stamped with the Hardwood background stamp #133035 from the Stampin Up annual catalog. 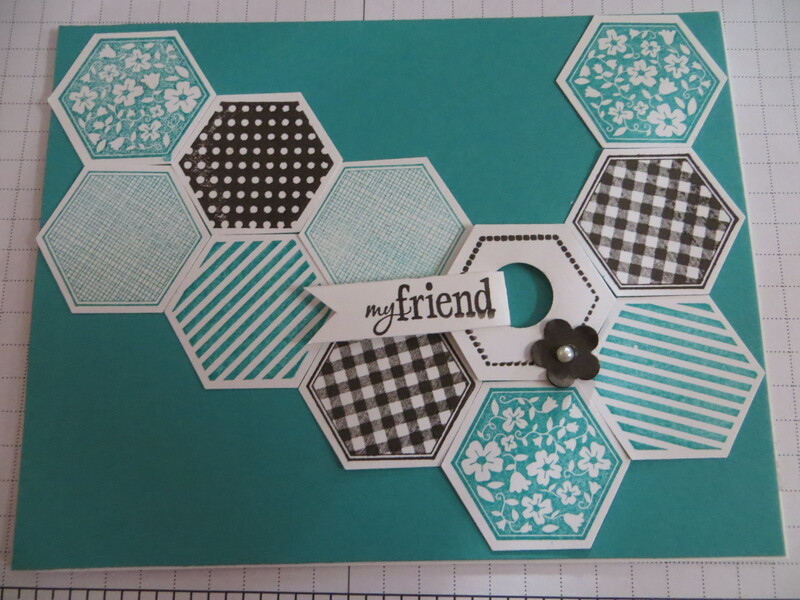 I then used the Hexagon Hive #132965 to create a trellis. I stamped and hand cut the flower from the now retired Happy Watercolor stampset and added the little leaves from the Little Leaves sizzlet (now retired). I added a piece of crushed curry Chevron ribbon #130019. The sentiment is stamped from the Happy Day (now retired) stampset and then cut out with the Apothecary Accents #127003 label and finished with 2 basic rhinestones. Today’s card is a real pick me up kind of card. Cammie created#131269 a coffee stain background using a Starbucks cup and a few drops of reinkers to make realistic stains. She added the 2 strips of Epic Day #131269 Washi Tape. She created a Tag using the Angled Tag Topper #133323. She stamped the coffee cup with the Perfect Blend #131392 stamp set in the Stampin Up annual catalog. 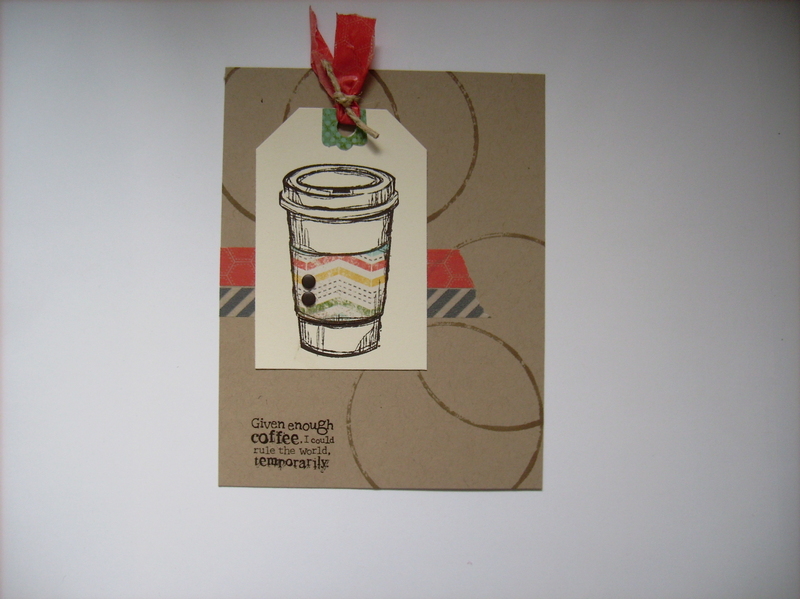 She stamped the coffee cup wrap was stamped on a scrap piece of DSP and then hand cut the wrapper and added neutrals candy dots #130934. The sentiment was also from the Perfect Blend stampset.